We woke up not knowing what today would bring, but boy did we have a variety of serendipitous things happen througout the day. We first drove to Maligne Canyon, and on the way there we saw a group of 12 or so female and young elk, including what we thought were twins. They were grazing along the side of the road eating the grass and flowers. They were really taking their time, so we got to enjoy them peacefully moving about for quite a while. 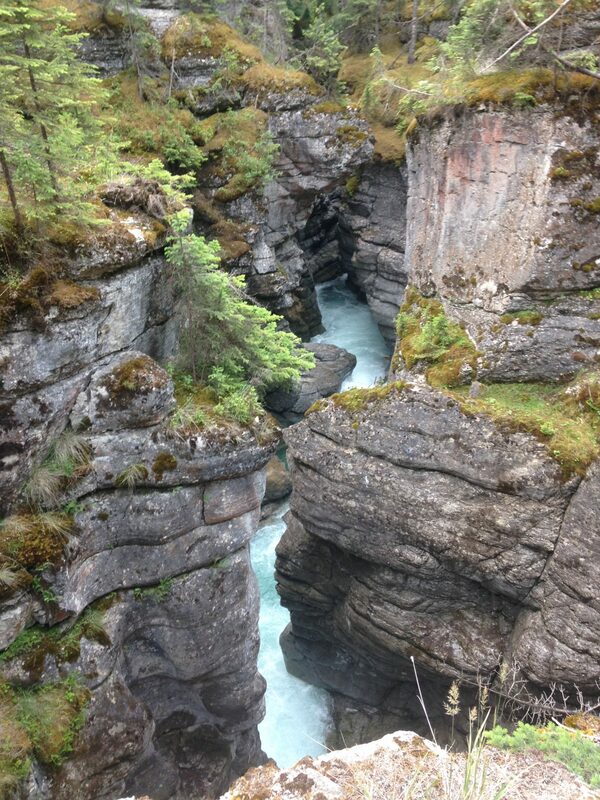 We continued on and soon learned that Maligne, which means means evil or wicked, is a gorgeous hike over 6 bridges that span a deep canyon with water falls. We got there early enough to just miss the tour buses and tons of people, so off we went. The drive south was so much better today, and my sadness from yesterday was wiped away because it was so much clearer and we could actually see the mountains today. We took this opportunity and stopped many times and took lots of pictures to replace all the smokey ones. It really is a breathtaking view along this road. For those of you familiar with Yosemite Valley in California, think of that but only twice as tall, twice as wide, and about as long as a third of the State of CA. Around another curvy mountain bend we saw huge group of mountain goats that kept running back and forth along the road. They seemed confused about which way they all wanted to go, and they held up traffic quite backed up for tourist to take photos. Soon we stopped to have lunch at Icefield Centre, and just as we walked into the restaurant and got in line the fire alarm goes off, and they completely evacuate the building. (we later learned that the smoke from the grill was not going to the vent properly and it set off the alarm) We and hundreds of other tourists had to wait outside for 10-15 min while they made sure everything was OK. When they let us all back in we basically made it almost to the front of the line, and quickly got food. We were then able to grab a table on the recently evacuated outdoor terrace. 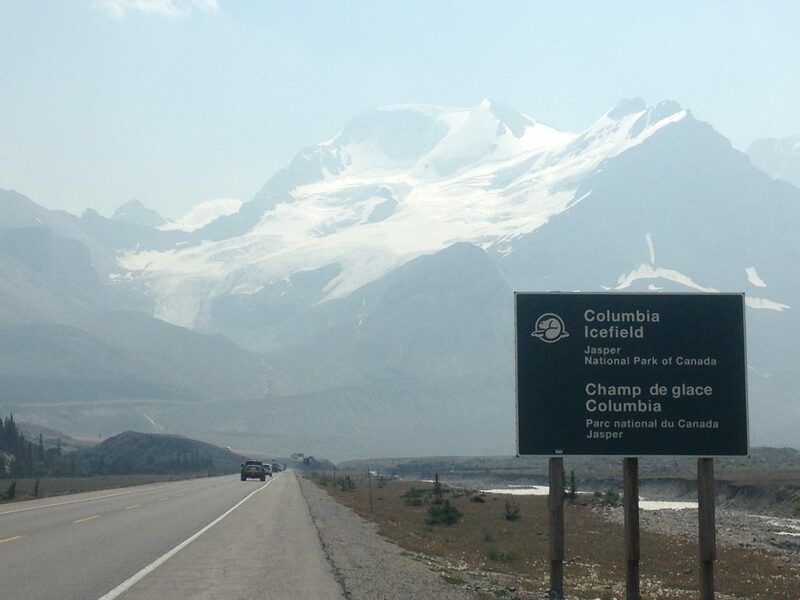 It was such a treat to sit outside in the sun, in full view of the glacier. The next thing that happened was almost a Twilight Zone experience. I was driving the sidecar, and Frank had stopped to take a picture when all of a sudden I see a motorcycle and sidecar on the other side of the road. What really caught my attention was that it had a sidecar that opened like ours, and it looked they there were two kids! I honked and we all waved at each other. Then I thought we should go meet them. Who else could be as crazy as us and travel around with their kids in a sidecar? I asked the kids if they wanted to go meet that other family and the both shouted “YES!” I turned around and we pulled up behind them. It was a mom and dad with 2 kids, almost the same ages as us, and one girl age 14 and one boy age 11. We talked for a while and found out we all had many similarities and adventures. They were doing the opposite drive that we were doing. 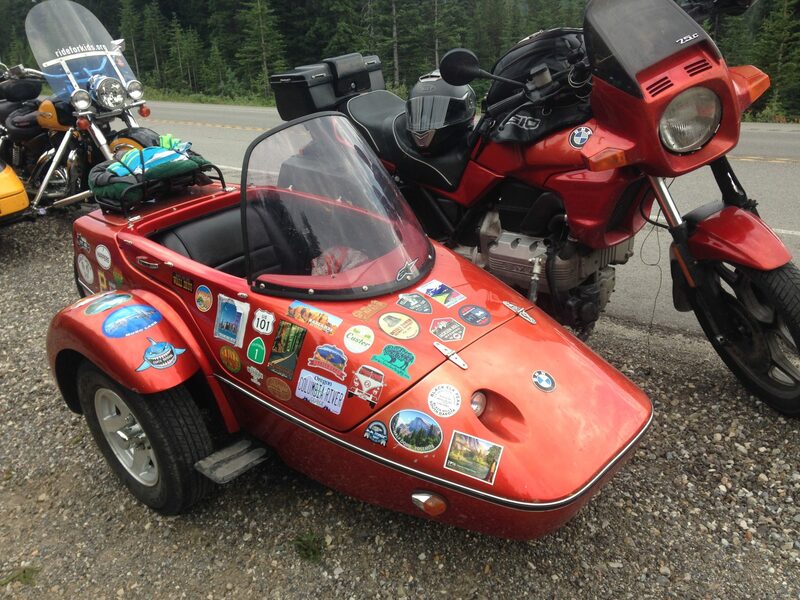 The only problem was their sidecar had way more stickers than ours! We needed to get working on that. We promised to stay in touch, and I can’t wait to see what other adventures they go on. Our day ended by crossing the Continental Divide again, and we headed to Radium Springs for the night. Who knows what is going to happen tomorrow? !